Documentation for Windows TCP parameters can be really hard to track down. Recently I was asked if TCP registry settings KeepAliveTime and TimedWaitDelay still apply in Windows Server 2012 R2. I haven't seen any Microsoft documentation referencing them since Windows Server 2008R2... neither had they. The best answer I can come up with for now (since not enough time to test) is: signs point to yes. Under the Windows Server 2016 'Performance Tuning TCP>>Deprecated TCP parameters', the list of deprecated TCP parameters below appears. Neither KeepAliveTime nor TimedWaitDelay are listed as deprecated since Windows Server 2003. Because KeepAliveTime and TimedWaitDelay are omitted from the list of deprecated TCP registry settings, for now I assume that they are still valid even though Windows Server 2012/2012R2 documentation seems to make no mention of them. Please let me know if you see Windows Server 2012/2012R2/2016 documentation referencing them... or if you test and can confirm active/deprecated. 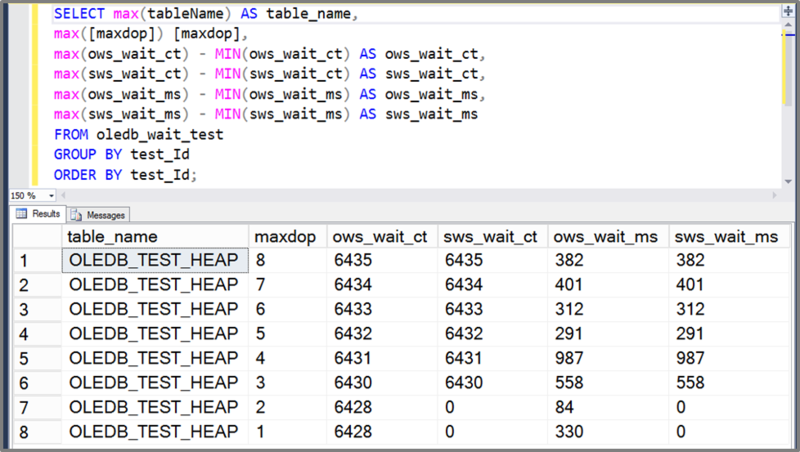 #SQLServer Checktable OLEDB Waits Part IV - how bow dah? Checktable OLEDB Waits Part III - the more things change, the more... wait, WAT?! OK. Through the first 3 parts of this epic saga we've taken a glance at checktable operations on a simple heap(with no indexes), a simple clustered index (no additional indexes). Let's take a look at a heap with a nonclustered index! The results below look vaguely familiar. 6456 total pages used. Starting at 6464 OLEDB wait events for maxdop 1 and 2. Up to 6471 OLEDB wait events at maxdop 8. 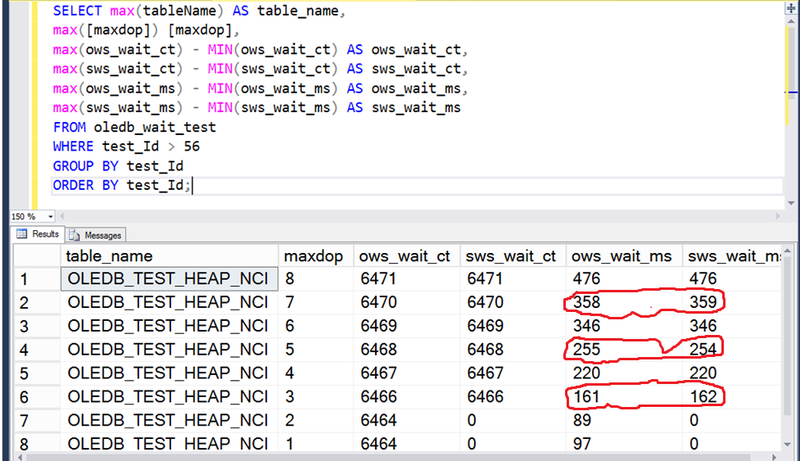 In the image below I've also circled a few of the OLEDB wait_ms numbers from system and session level wait DMVs. Circled because today is the first day I've noticed differences in the numbers - although I've yet to see a difference greater than 1 ms. Still - as far as I'm concerned even a difference of 1 ms is a hint that *maybe* session and system level waits are tracked separately rather than a single source that updates both of the views. Now - if we change to running without physical_only, will we get some multiple of the table row count, since there is a nonclustered index? Recall that the clustered index sustained nearly four times the row/page count as the number of OLEDB waits in a checktable without physical_only. Nope. 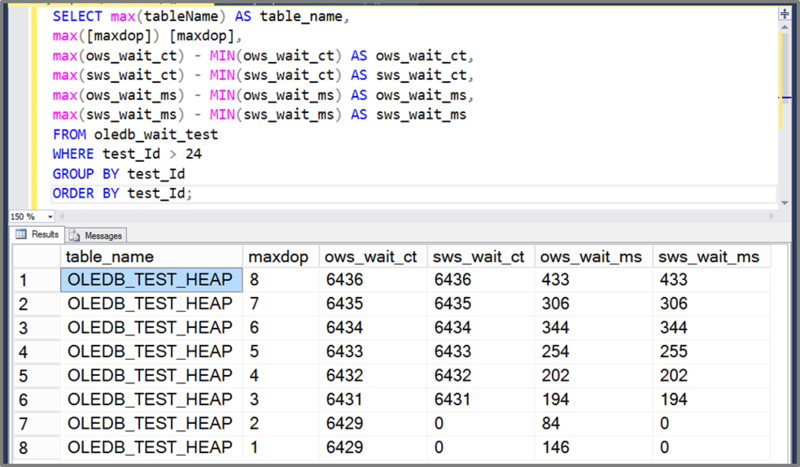 Just a small incremental additional number of OLEDB wait events, starting at 6519 and working up to 6526. Huh. How many pages are we using? 12865. Let's proceed with 8 physical_only checktable operations. How's it look? Pretty familiar. 12865 pages in use, a small overhead gets us 12909 to 12916 OLEDB wait events. Ok, now 8 checktable operations without the physical_only option. And there's that really large jump in OLEDB wait events as the checktable operation drops the physical_only operation. Third part of an adventure in #SQLServer Checktable. OK. We've seen some stuff with a simple heap. Let's trade in the heap for a clustered index with the same row values. The clustered index uses a few more pages - that makes sense. More structure to maintain for a clustered index than for a heap. So let's perform the physical_only checktable operations on OLEDB_TEST_CLINDEX. Based on the previous results, we'll expect the number of OLEDB wait events to be close to the number of pages in the clustered index. And we expect OLEDB session waits to not update for MAXDOP 2 or 1, even though instance level OLEDB waits will update. How do the results match our expectations? Pretty well. OLEDB_TEST_HEAP used 6408 pages, and OLEDB waits started at 6428 for MAXDOP 1 and MAXDOP 2, increasing by one for each increase in MAXDOP from 3 to 8. OLEDB_TEST_CLINDEX used 6438 pages, and OLEDB waits start at 6458 for MAXDOP 1 and 2, and increase by one for each increase in MAXDOP from 3 to 8. All right. Let's move on to removing the physical_only parameter. 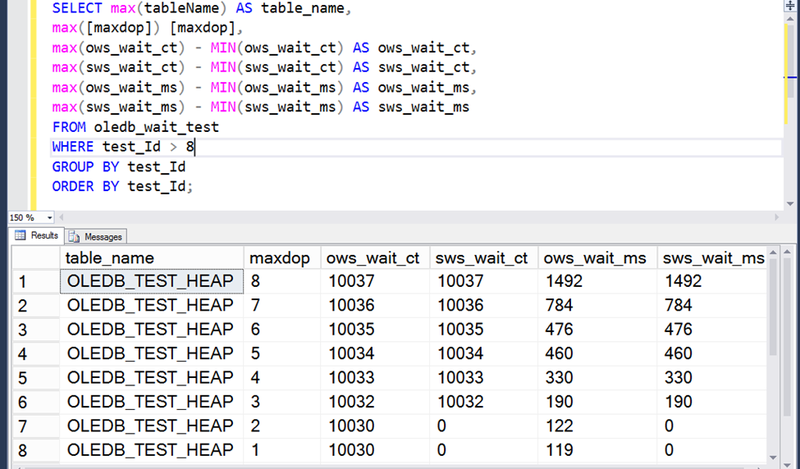 With OLEDB_TEST_HEAP we saw a minimal change in the number of OLEDB wait events between a checktable with and without physical_only. So how do the results match with expectations? Whoa!! 25745 OLEDB wait events as the starting point for MAXDOP 1 and 2. 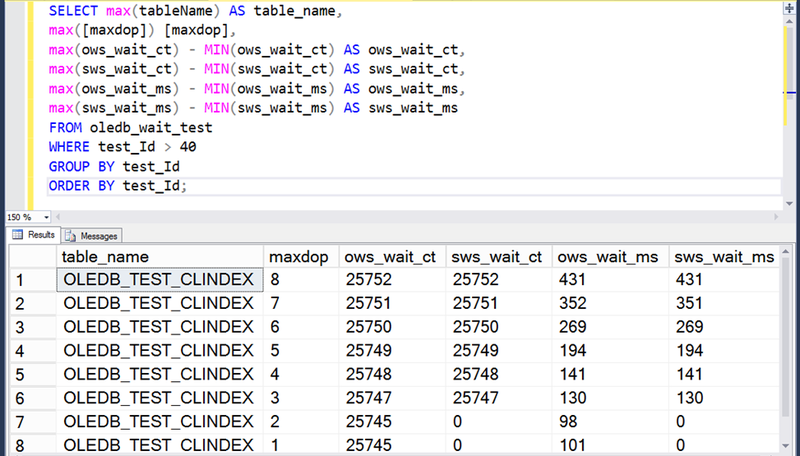 Then single-stepping up to 25752 OLEDB wait events for MAXDOP 8. 25752 is exactly 4 times the used page count of 6438 for the clustered index. So the OLEDB wait events went from a small number more than the count of pages/rows with the heap... to almost 4 times as many with the clustered index. *That* was a bit unexpected. In Part I, the main focuse was on OLEDB waits in a checktable with physical_only on a heap table with 6400 rows, at 1 row per 8k page. Part II is gonna be pretty brief - but there's more coming I promise!! What happens if the logical checks are included in the checktable operation on this table, by removing the physical_only option? In this case, not very much. In comparison to the physical_only checktable operation, at each DOP the number of OLEDB wait events increased by one. 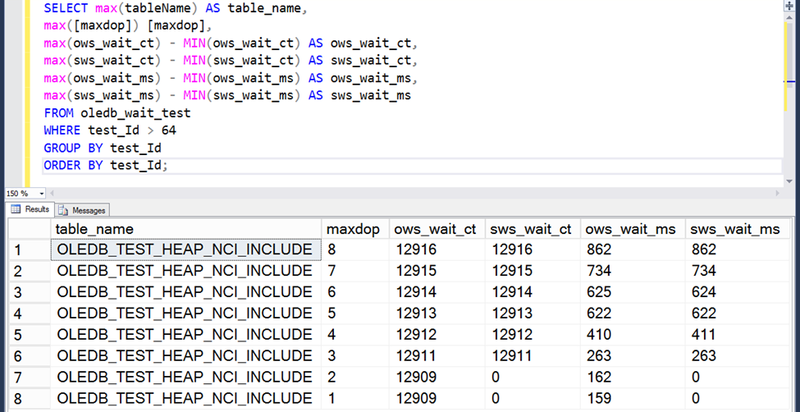 Maxdop 2 and 1 still have the same number of OLEDB wait events, while from maxdop 3 to 8 the number of wait events increases by one each time maxdop increases by one. 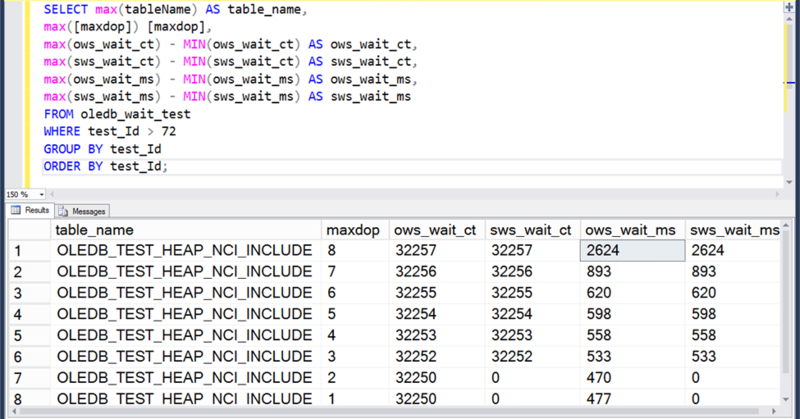 And as was seen previously, at maxdop 2 and maxdop 1 the session waits DMV isn't catching the OLEDB wait activity associated with the checktable operation, even though it is being captured at the system level. 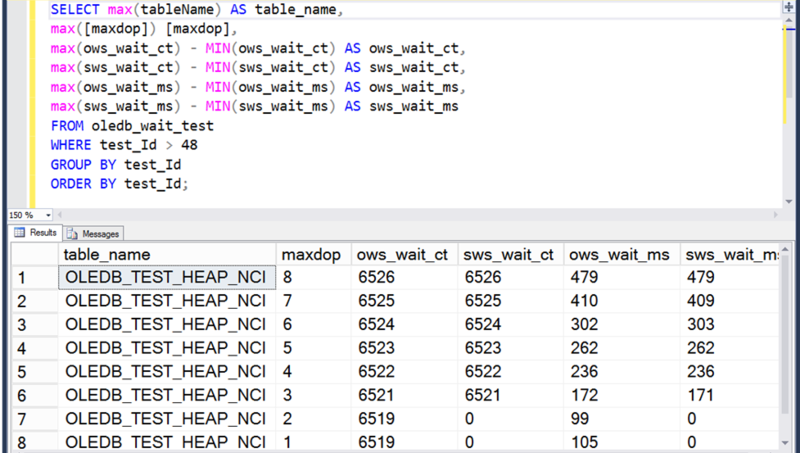 On this very simple heap, with nearly the same number of rows as pages in the heap, the number of OLEDB wait events is nearly the same - only increased by one - when "upgrading" the checktable operation from physical_only to a checktable with logical checks. Let's finally start looking at behavior surrounding the OLEDB wait type during checktable operations. These tests, as previously, are running on an 8 vcpu Windows server 2012 R2 vm (VMware) with SQL Server 2016 SP1. Since I plan to do a lot of testing, create a table to store some test definitions and results. OK. Let's create a very basic heap to submit to checktable operations. Its really, really easy for me to skip a detail like coalescing NULL values in wait tables to zero in order to get valid deltas... so lets encapsulate the test and results capture in a stored procedure. All right. Let's run 8 tests - from MAXDOP 8 in decreasing order to MAXDOP 1. And what was captured for OLEDB wait stats during each checktable? OLEDB wait count at the system level ranged from 6428 at maxdop 1 and maxdop 2 up to 6435 at maxdop 8. Interesting. The table OLEDB_TEST_HEAP was constructed with 80 * 80 = 6400 rows, each of which are expected to consume an 8k block (because of the 4000 character NVARCHAR and the lack of compression on the table). Since these results are from physical_only tests, could the number of waits be related to the number of blocks in the heap? Let's resize OLEDB_TEST_HEAP to 10000 rows and see what happens. Now run the same tests as above, with maxdop decreasing from 8 to 1, and display the results captured. Interesting. Very interesting. So... yeah. Definitely a relationship between the number of pages in the heap and the number of OLEDB waits. Something(s) increase the number of OLEDB waits beyond the number of data pages, the number of used pages and the number of reserved pages in a way that I haven't deciphered yet, though. One thing is clear - above maxdop 2, one OLEDB wait is added for each incremental increase in maxdop. That's interesting. Another interesting point: at maxdop 2 and maxdop 1 the number of OLEDB system waits are equal rather than decreasing again by 1. Hmmm. 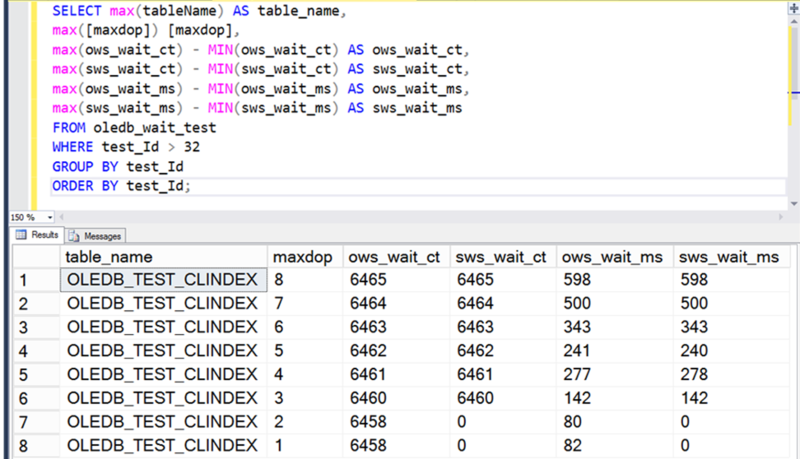 And the most interesting thing: at maxdop 2 and maxdop 1, the session OLEDB waits seem not to update. I created a connect item for the OLEDB wait disappearing act in the session wait DMV sys.dm_exec_session_wait_stats. The repro in this blog post is better than the one I put in the details of that connect item :-) I'll update the connect item later.